Everyone deserves a great audio experience! In fact, in this current day and age, you shouldn’t have to spend thousands of dollars to get a studio-like sound listening experience. The leaps and bounds made in the technology niche have flooded the market with affordable options for the amateur or connoisseur. To prove my point, I’ve written this article about Audiophile PC Speakers that offer accurate sound without costing an arm and a leg to get an immersive sound listening experience. The Cyber Acoustics CA-3602 is the first in line when it comes to cheap Audiophile Level Sound Experience. No doubt that it’s drastically better than other 2.1 desktop speakers available on the market, but it also provides an aesthetically pleasing sound for a price of under $50. The package contains two 2” drivers, satellite speakers of 6W each, and a subwoofer providing a sound of 18W. The total sound wattage of the Cyber Acoustics CA-3602 is 30W. Being generous, the company also throws in a controller knob - similar to the ones we see in Bose Companion 3 Series speakers for PC. This controller is connected to the subwoofer and has a large dial on the top acting as volume controller. It also includes one port for headphones out and another AUX in-port. Toward the right side of the product is a bass +/- knob, and on the left is the Power On/Off button. Before you make the choice to purchase this product, make sure you have enough space to keep the subwoofer as its dimensions are 8” X 10” X 8” (L X H X D) while the satellite speakers can sit on a desk at a much smaller size. At a price of just under the ballpark of $50, Cyber Acoustics is definitely a steal compared to other pricier models from Logitech and Creative. Despite being constructed of plastic materials, the quality is still top notch and isn’t anything to complain about. Last words: Cyber Acoustics CA-3602 will find great application when it comes to watching movies or while playing games. I am a big fan of Monoprice Audio Products, along with many other budget audio enthusiasts who believe that this company provides great sounding audio products at a very cheap price. Let’s see how these inexpensive audiophile bookshelf speakers are able to stand against other products on our list of Best Audiophile Speakers for PC. As you can see in the image, Monoprice 8250 are bookshelf speakers with a very basic and stripped-down design. One speaker is 12 inches tall, 6 inches deep and 8 inches wide and will require plenty of space to sit on either side of your desktop monitor. Each speaker contains a 6½” woofer and ½” dome tweeters which produce great low frequency sound. At a price of just under $50, the sound quality is easily comparable to other bookshelf speakers costing well over $120 from brands like Pioneer. As far as looks go, these speakers aren’t going to win any prizes. But when it comes to sound they pack in a lot of punch. If you want speakers that sound great but aren’t worried about making a stylish statement when not in use, Monoprice 8250 are a valid option. Don’t forget to check out CNET’s review of the Monoprice. Since they don’t come with any internal amplification, you might want to check out our guide about best desktop amplifier under $200. Last words: Monoprice 8250 are silent warriors that aren’t high on hype but definitely high on performance. M-Audio Studiophile AV30’s are not your average desktop speakers. These are actual active studio monitors, considered to be audiophile-grade speakers. They definitely deserve a mention on our list. When it comes to size this product looks similar to any other bookshelf speakers, but looks can be deceiving. The M-Audio AV30 is a cheaper alternative to the already popular M-Audio AV40. Included in the packaging of the M-Audio AV30 is a pair of speakers, RCA and stereo cables, a power cord, a pair of rubberized bases, and the user manual. The AV30s are 8” high, 5.3” wide, and 6.3” deep, weighing at around 11.7 lbs. These speakers feature a 3-inch woofer for tight and accurate bass, and a 1-inch tweeter for clear and pristine highs. M-Audio Studiophile AV30s are designed so that they can sit right next to your desktop screen or laptop, allowing you to enjoy authentic audiophile sound quality. 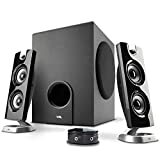 These speakers are mainly targeted toward home studio artists who record and produce their own music, and are looking to get accurate sound response. The design looks fairly good when compared to the already mentioned Monoprice 8250 bookshelf speakers. The front of this product features an AUX port and headphone jack as well as volume knob. Included is a blue color backlight that gives the speakers a great ambiance. The M-Audio Studiophile Av30, being a stripped-down version of AV40's, has had a lot of cost cutting done to keep the overall price down. The internal amplifier isn’t at par compared to the one included in the AV40. Prospective buyers might want to invest in a good DAC + Amp under $100. Last words: Don’t be mistaken - for any audio enthusiast or anyone looking for a replacement for crass sounding desktop speakers, the AV30’s are an ideal best budget buy. Up until now the speakers that we’ve covered have been huge and bulky and err... didn’t look especially pleasing to the eye. Let’s just change things up a little bit and bring style statement back to speakers under $100. One company that has time and time again delivered great sound experience along with excellently designed audio products is Bose. Bose Companion 2 Series III desktop speakers are an update to Companion 2 Series II audiophile computer speakers. With Series III, Bose introduced a black matte finish design on speakers with a foam grill, compared to metal grills on previous product lines. For a price under $100, the box contains an instruction manual, 3.5mm male-to-male wire, sleek power adaptor, and finally, a pair of Bose Companion 2 speakers. The right speaker features a volume knob and headphone jack on the front, whereas the back houses a connector port to connect the two speakers, DC power port, RCA input and AUX input. The volume of the Bose Companion 2 Series III audiophile computer Speakers isn’t very loud and it’s little off from their usual silver colored speakers. However, this new design does look high-end and can easily compliment your desktop or laptop with its clean design. Sound wise they are definitely better than other 2.0 computer speaker offerings on the market. Make sure to read this entire review before you're in the market to buy them. Last words: If you’re ready to shell out $100 for great sounding speakers for a PC from a premium brand, Bose Companion 2 Series III is the right fit for you. If Bose Companion 2 is not your thing and you feel you need a little more bang for your buck without much hassle, then Creative Gigaworks T20 Series II is a great deal. The original Gigawork T20s were a mess. They were lousy and priced way too high for what customers were getting. However these upgraded versions sound as they should for the price you’ll pay. These happen to be some of the best computer speakers under the $100 price range. We’re aware that spending somewhere around $100 for a pair of 2.0 speakers doesn’t feels like a good investment, but if you hate the hassle of managing multiple speakers along with a big subwoofer, and if you live in a smaller house, the Gigawork T20s might be right for you. As far as the design, it’s nothing sort of extra ordinary. However, the yellow colored speaker cones do attract attention. At the front we have a yellow colored speaker that handles the mid-range sound; below it is a small tweeter, and above, a Bass speaker that eliminates the use of a sub-woofer. The right side satellite is the active speaker and has set of control knobs and ports on it. You get brushed aluminum finished knobs that have control for treble, bass and volume. The volume control port also acts as a power switch. When it’s turned entirely down the speakers turn off. The volume knob has a cool blue backlit light that indicates the speakers are on. Below that are two ports; one is a headphone port that allows you to listen music via your headphones and another one is an aux-in port allowing you to play music on speakers via a smartphone using a 3.5mm audio cable. We do suggest pairing the T20 series with a quality DAC and you’ll be absolutely set. Last words: The Creative Gigaworks T20 Series II happen to be the best budget computer speakers under $100 that work like a charm and will satisfy all your audio needs. Harman Kardon Soundsticks III are the most handsome looking best audiophile desktop speakers on our list. With a clear case design and exclusive build, these speakers are meant to grab everyone's attention. They utilize a 2.1 channel speaker system that consists of a down firing subwoofer and two satellite speakers. The package comes with a quick start guide, RCA connectors, power connector, a subwoofer, and dual satellites speakers. The satellites contain 4x1” transducers, each consisting of a10 watt amplifier. The subwoofer holds a 6” down firing bass powered by a 20 watt amplifier. The satellite speakers, also referred to as soundsticks, have a unique rotating stand. This allows the speakers to be adjusted to any desired position or whatever angle to fit your needs. Placing the soundsticks on either side of your desktop monitor will give any setup that futuristic, out-of-this-world feel at all times. The right satellite speaker has a touch sensitive volume control. Each subwoofer contains plenty of connectors including one power connector, two ports for connecting satellite speakers, a 3.5mm audio output jack, and a very small bass adjustment knob. The set mentioned here consists of wired speakers and costs around $150. There’s also a version available for $50 more, which eliminates disturbing wires and still retains the same sound. "If you want a great audiophile computer speakers that adds glamour and style to your desktop; Harman Kardon Soundsticks III are the one to go with." Klipsch is a colossal name in the audio industry when it comes to great quality audio products at a cheaper price. They have made an immense name for themselves in the budget earphones sector. The company has also been known to manufacture some of the best reference based studio monitors and studio headphones as well. Therefore the next audiophile PC speaker set we’re presenting is the Klipsch ProMedia 2.1 THX Certified Desktop Speakers. Since they are THX certified, users can experience the same quality of music that the producer had intended. This inclusion gives the speakers a well-deserved spot on our list. Design-wise they don’t stand out as compared to the previously mentioned Soundsticks III, but for visitors in your house it could be hard to digest that these speakers cost under $200. Just like their headphones, these speakers have a great balance between the mids, the highs aren’t harsh at all, and there’s plenty of punch in lows as well. With a total output of 160 watts these speakers are loud - impressively loud for a desktop configuration. They can be considered the best audiophile speakers in the 2.1 channel sector. Compared to other speakers in a similar range customers are going to hear more details from the Klipsch and sound quality is incredible on these. Build-wise they are made up of tough fiber plastic which won’t give up on you easily. Even the material used in the subwoofer is sturdy and built like a rock. Last words: Durability won’t be an issue with this product, as they are meant to last. Coming from a premium brand, the Audioengine A2+ Desktop Speakers are available in 3 colors: black, white and red! I am a fan of Audioengine’s sleek and minimal design for their speakers, as well as their DACs. Speaking of DACs, the Audioengine A2+ comes with integrated DAC which allows listeners to enjoy noise-free audio straight from their computer. The quality of the build is what grabs the attention on these audiophile speakers. They’re made from 18mm thick wood and are built to last. Integrated USB DAC delivers HiFi sound straigt from computer. Since the speakers are handmade, they also feature Kevlar-built woofers and silk tweeters. The Kevlar woofer driver size is 2.75 inches whereas the silk dome tweeters have a size of ¾ inches. Audioengine A2+ speakers are 6 inches high, 4 inches wide and 5.75 inches deep. The front of these speakers is simple and features no controls or button. The back has a volume knob, RCA input and output ports, a USB Input, a power port, and left to right speaker connector. Despite such a minimalist design, the sound quality of these is good enough to fill an entire room during parties or functions. Users can even attach these speakers to a subwoofer and enjoy a deeper sound. Last words: We must say, a lot has gone into building these speakers and the price is totally justified considering the top of the line brand and authentic sound. There are only so many products that get an almost 5-star rating on Amazon; Polk Audio RTi A1 bookshelf speakers are one of them. With a complete wood design of MDF construction, these audiophile desktop speakers offer a resonance-free sound. A1’s comes in two colors; black and cherry. These are not your regular audiophile bookshelf speakers. They are huge in size with a 5.25 inch woofer and 1-inch silk/polymer composite dome tweeter. The package includes a pair of bookshelf speakers, pair of self-tapping screws, 8 self-adhesive rubber feet, an instruction manual, and connector cables. These speakers are 12 inches high, 11.5 inches deep and 7.5 inches wide, meaning you’ll require a good amount of space to place them on either side of your desktop. The A1’s are definitely not your average computer speakers. If you’re looking for boom-y sound effects, deeper bass, high reverberations and earth-shaking speakers, you can get them here for a cheaper price. Check out the entire review of these speakers here. At this price point, only invest in a beast like this if you’re serious about your music. Last words: Polk Audio RTi A1s play in the big leagues of serious audiophile users who would pay any price to hear their music sound pristine. Well, here is the Audioengine A5+, which happen to be a big brother of the previously mentioned Audioengine A2+. I can confidently say that the Audioengine A5+ are similar to the A2+ in terms of design and looks, and don’t have the shortcomings of the A2+. These too are handmade from 1 inch of thick MDF board. The Audioengine A5+ comes in two colors - black and white. For those interested there’s also a another version costing $70 more than the standard version built entirely out of bamboo wood. They feature 5 inch Kevlar-built woofers and 2 inch silk dome tweeters along with neodymium magnets. The package includes a pair of Audioengine A5+ speakers, a remote control, speaker wire, detachable power cord, RCA cables, a cloth speaker bag, and setup guide. Unlike the Audioengine A2+, the A5+ thankfully displays the volume knob on the front of the product. The bass vents have been pushed behind. These PC speaker also have a heat sink at the back of one A5+ speaker, allowing heat to easily dissipate and keep the speakers cool as they go to work. Due to these changes, the company recommend keeping a space of at least 6 inches between the wall and back of these speakers. Also, make sure you have plenty of space on your desktop to put these as they are 10.75 inches high, 7 inches wide, and 9 inches deep. They are the second biggest desktop speakers on our list. Last words: Overcoming all the cons of the A2+, Audioengine has definitely added a lot of punch and great features into the A5+. With woofers and tweeters twice the size as the previous model, you’re destined to listen to rich lows and great clarity in highs. Here’s to the great looking audiophile PC speakers in our list! 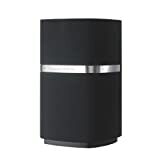 The Bowers and Wilkins MM1 speakers set an example of how a premium desktop speaker should be built. Both speakers are covered from top to bottom with a fabric grill and separated by a silver metal strip in the middle. Featuring a built-in DAC, they make sure your sound is noise free by converting the audio from digital to analog signal inside the speakers, rather than in your computer. Both speakers are marked with “left” and “right” markings, so you know which speaker stands where. They feature a 3 inch woofer and 1 inch tweeter on both speakers. This allows the device to have a very small footprint and take up less space on your desktop. One downfall as far as style goes is that the fabric covering on these speakers gathers dust easily and is difficult to clean at times. The MM1 connects directly to your computer via a USB port and features an input and output 3.5mm jack and mini USB port for connecting to your PC. "The genius thing that the company did is that they put inputs to these speakers at the bottom instead of the back to retain a constant 'look and feel' all around these speakers."